I have been trying to transport Mail for several years unsuccessfully. I created in major towns a inner route for mail to the train station and from there a train takes the mail to and from the city. Almost every train has a mail carriage (unless it is an inner city metropolitan services). Yet, each train doesn't transport more than 4 or 5 mail. I'm still in 1899 so maybe it's related to low inner city speeds, yet those stops have plenty of passengers (the passengers horse carriages are slower). Wasn't supposed Mail to be more important in pre-technology era? Or am I simply doing it wrong? One thing that is currently important with mail is what proportion of towns (specifically, what proportion of mail generating buildings) that you actually serve: if this is a small proportion, most of the mail generated (which is fairly small in any event) will go to buildings that your transport services cannot access, and so will not travel. That is the theory at least. Unfortunately there is at least 1 bug with mail generation currently. Under currently unknown conditions having 2 stops 3km apart can generate upwards of 8,000 mail per month between them limited only by transport speed. How this mail is being generated I am unsure, but the fact it is being generated may effect mail generation to other locations. And does Mail work like passengers with the time rule, that is, less regularity less mail? No mail does not care about travel time when it is sent. It does care to take the fastest available route applicable for its class if many are available to its destination but the same amount of mail will be generated between stops if the journey time is 1 second or many years. I have a question. Does this building generate mail? There are five classes of passengers but Mail has only two classes in pak128.britain-Ex. In this building, the Lowest class and the second lowest class are set to 0% but it has a higher Mail demand/output. Mail classes have nothing to do with passenger classes as far as I am aware. I think some fraction of mail is generated first class with the rest as lowest class. We should perhaps modify this so that the mail proportions can be set in simuconf.tab. 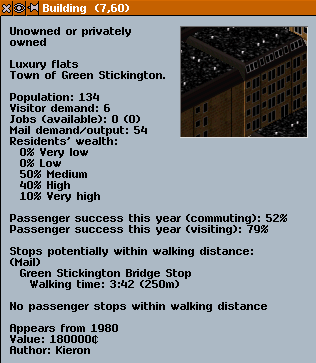 Each building should have different mail class production rates just like for passengers. This is because something like a law office or bank might make more "first class" mail than a grocery shop or garage. The average residential house for the poor in the 1850s might not make any first class mail. I agree with DrSuperGood - the mail production rate should be customisable in the same way as the passenger rate. I didn't implement this at the time because it was outside the scope of what I was working on, and I didn't know enough of Simutrans to be able to easily add the feature. It was always my intention that someone would replace my temporary bodge at a later stage.